The BBC World Service "I Challenge" series looks at individuals around the world who have challenged authority, traditions and beliefs in the face of enormous odds. 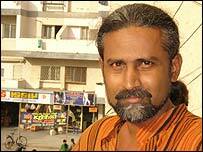 Here, we speak to Stalin K, a human rights activist who has being running a revolutionary radio programme to expose corruption in India's western Gujarat province. 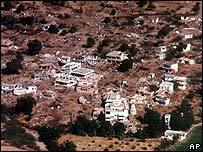 Stalin K came up with the idea of the programme after, in January 2001, Gujarat suffered one of the worst earthquakes to hit India in half a century. More than 20,000 people were killed by the 7.9 magnitude quake, and more than a million were made homeless. Stalin K, who says his father named him in honour of the former Soviet leader, has turned a group of villagers into fearless reporters prepared to challenge people in power. Stalin K's community-focused programmes are broadcast on state radio in the poor rural region of Kutch, Gujarat's largest district. In the months following the earthquake, he put together a radio programme called To Be Alive looking into issues relating to compensation, government handouts and shelter programmes. A few months later, he launched a programme investigating abuses of power that got "under the skin of powerful people," as Stalin K puts it. "It became very popular," he says. One case involved a local politician who had gathered all the compensation money destined for the quake victims in a remote Kutch village. He kept a "princely amount" for himself and handed out the rest to the intended beneficiaries, Stalin K says. When confronted by Stalin K's reporters, the politician, who was being secretly recorded, denied everything. When the report was aired, he lost all credibility and was voted out of office the following year. The programmes are made by rural people themselves, trained by Stalin K and his collective to become radio reporters. "They are 'poorly educated' but they are extremely creative and intelligent people," says Stalin K. "They write, record and edit the programmes." Although all of the recruits, men and women, were only semi-literate, the medium of radio proved liberating and they learned quickly. Stalin K recalls one of his first training sessions involved demonstrating how to sit on a chair. Five years into the project, he must remind his reporters to be respectful towards people in authority. "You can see the transition: from a place where they did not even want to sit on a chair in front of a bureaucrat, they have become so empowered that they have started talking rudely to these people," says Stalin K.
"These kids were so empowered by what they were doing, they realised that government officials irrespective of their position can be accountable to them." The programme became a sort of public watchdog - and issued a warning to those tempted to abuse their position that somebody was watching. A more aggressive style of reporting involved so-called "radio raids", where a whole team of reporters would focus entirely on one particular issue. One of those involved a doctor who was charging women for delivering their babies at a community health centre, when in fact the service is supposed to be free for poor people. The programme's expose led to a government inquiry into primary health centres across the country where illegal charging was believed to be taking place. "It's not only changed the public's view of reporting but it's changed the people's expectation of accountability within the authorities," says radio reporter Binu Alexander. But the biggest obstacle to community radio is the government's refusal to let programmes like Stalin K's broadcast independently. Despite a Supreme Court ruling in the mid-1990s declaring the airwaves public property, the government is wary about giving such programmes total freedom from state control. But a shift in policy maybe taking place. The BBC World Service has learned from a source in the Ministry of Information and Broadcasting that volunteer and charitable organisations should be able to run their own stations within a year.